Do you ever hide your smile because of your missing teeth? Do they make you limit your food choices, or do they make speaking feel awkward? If you are like most people dealing with this issue, the answer is probably “yes” to more than one of these questions. Dr. Thomas Novak and our team believe that everyone should have a complete smile they can be proud of, so for people with missing teeth, he can help them with dental implants in Weatherford. 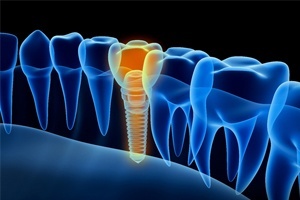 Dental implants are the most state-of-the-art tooth replacement solution available today. They also offer the most benefits with it comes to security, longevity, and aesthetics when compared to any other treatment. Over a 95% 10-year success rate. Regain as much as 70% of your biting force. Can last for several decades. 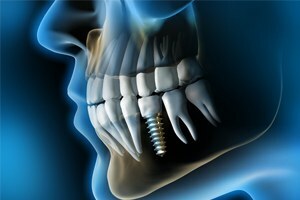 An implant is a special surgical grade titanium post used to replace the root of a missing tooth. In restorative procedures, one or more implant posts are inserted surgically into the jawbone below the gum surface. This requires oral surgery, but with today’s anesthetics and medications, this process is quicker and more comfortable than ever. Plus, unlike many other local dentists, Dr. Novak can handle this part of the procedure himself, saving you the hassle of having to go between two different offices. Following your procedure, the post(s) naturally bond with the bone in your jaw, forming a secure foundation onto which your new teeth are attached and shaped to match your mouth. The number of teeth that need to be replaced will determine the best kind of restoration for you. Dental implants can help replace a single tooth, a few teeth in a row, and even a full set of teeth. To replace a single missing tooth, your dentist in Weatherford, Dr. Novak can use something called an implant-retained crown. 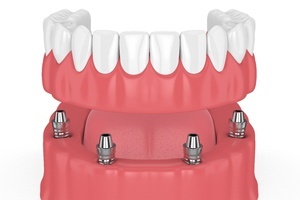 He places an all-porcelain crown on top of a metal connector that is attached directly to the implant posts. 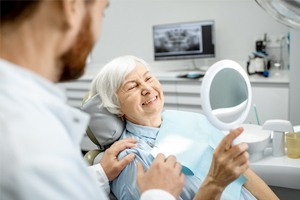 If you have a few missing teeth in a row, Dr. Novak can place an implant-retained crown on either side of the gap in your smile and attach them to prosthetic teeth to close the space. This is known as an implant-supported bridge. If you are dealing with an unreliable and uncomfortable denture, dental implants can help. Using just a few strategically placed posts, Dr. Novak can give you a partial or full denture that will never slip or cause irritation. This treatment is ideal for patients who do not have enough healthy jawbone to support a traditional implant-retained denture. Dr. Novak can give you a full implant-retained denture using as few as 4 implant posts. In fact, the implants and the denture can often be placed in just one day. If your smile is marred by missing teeth, Dr. Novak can help. Thanks to dental implants, he can give you a lifelong solution to feel confident for decades to come. If you are ready to get rid of the gaps in your smile, contact us today for a consultation.